Translations: Moving Between Cultures proudly returned to New York for an exhibition at the New York’s Czech Center in Manhattan. 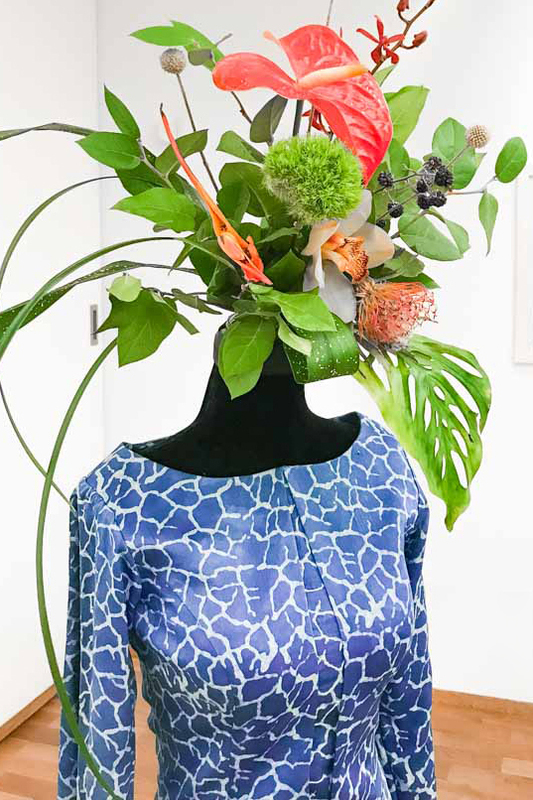 Over the two weeks of the exhibition, visitors admired the collection’s rich colours, original designs, and aesthetic tranquillity, as well as the striking display, which included stunning bouquets crowning the mannequins. In creating Translations, Iva drew on traditions and techniques of multiple cultures, highlighting how we can move between cultures not only when choosing garments, but in every sphere of our lives. Each garment in the collection flows with and accentuates the human body, making it easy to wear and bestowing an elegance that is characteristic of Iva’s stunning designs. Iva's time in India in 2017 inspired many of the colours and designs of Translations, which features the intense indigo blue for which India’s Bagru region is famous, and an intricate design created using ancient block-printing techniques. True to her desire to share and inspire, Iva conducted a workshop with fellow Czech artist Petra Valentová on the opening day of the exhibition. Each guest learnt the techniques Iva had immersed herself in during her time in India, and took home beautiful pieces featuring their own original designs.